Lately, I’ve been craving ketchup – without Monsanto corn syrup and other artificial ingredients. 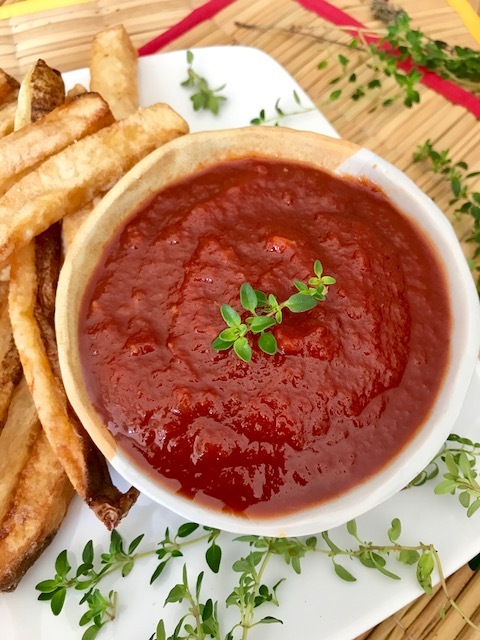 Here’s my organic, homemade ketchup – you won’t believe how DELICIOUS this is! 1. Pour ground tomatoes into a crockpot. 2. Swirl 1/2 cup water in empty tomato container and pour the mixed liquid into crockpot. 3. Add agave nectar, maple syrup, vinegar, onion, garlic, salt, mustard powder and cayenne pepper. 4. Whisk all ingredients to combine. 5. Cook on high, uncovered, until mixture is reduced by half and very thick, 8 to 10 hours. 6. Stir every hour or so. 7. Let ketchup cool to room temperature. 8. When ketchup has cooled, it will be thick with small bits of cooked onion running throughout mixture. If a smoother consistency is desired, transfer ketchup to a blender and puree about 20 seconds. 9. Transfer ketchup to a 2-cup jar. Seal jar tightly and refrigerate up to 4 weeks. 10. Use ketchup as needed.